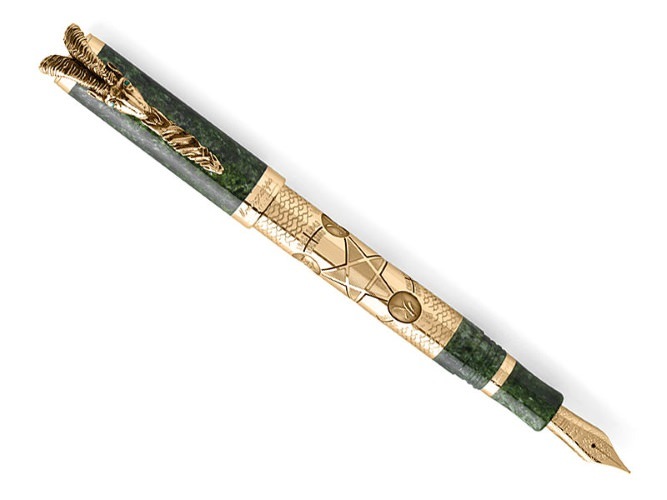 Montegrappa continues one of our most-beloved traditions. Its new offering for 2015, created for those who follow the Chinese Zodiac, with appeal, too, for pen collectors in general, honours the Year of the Goat. It communicates the qualities of one of the most charming creatures in the menagerie. Goats enjoy key roles in literatures and the arts, in folklore and fairy tales. They have been used to embody everything from stubbornness to an unduly healthy libido, while reality shows us a different side of the animal: Goats are inquisitive and intelligent, while the wilder breeds that inhabit mountainous regions exhibit remarkable coordination, ideal for maintaining their balance in precarious places. More comically, goats eat almost anything, though their preferred diet consists of the more savoury parts of woody shrubs and trees. Domesticated, they provide milk and meat, their cheeses enjoying global popularity. Their soft hair is woven into clothing. While the Goat is a proud, bossy animal – not to be angered – those born in the Year of the Goat counter this with kindness and gentility, showing concern for others. A stubborn streak leads them to setting their own agendas, revealing an aversion to too much discipline. They can be offended if criticised. As they dislike working under pressure, Goats perform best when left to their own pace. Goats do work best with some guidance, and wish to find companions to look after and care for them. Goats can be artistic and industrious, as well as adventurous. Famous Goats include Michelangelo, Rudolph Valentino, Mark Twain and Orville Wright. As this group of celebrated individuals demonstrates, they are passionate about what they do and what they believe in. But Goats they be shy or pessimistic, or even timid by nature. Goat people are wise and gentle, showing compatibility with those born in the years of the Rabbit, the Pig and the Horse. Being sincere, they are compassionate, understanding of others’ faults and quick to forgive. In return, good fortune smiles upon the Goat, and even during hard times, the Goat manages to satisfy the basic needs, without force or violence. Goats find it hard to be practical and love a life of luxury and ease. They hate to displease anyone, especially their loved ones. They are too sensitive and often overreact, and thus benefit from reassurance. Most endearingly, Goats are true romantics. Appreciation of their talents supports Goats’ self-confidence, so with encouragement, they will succeed. 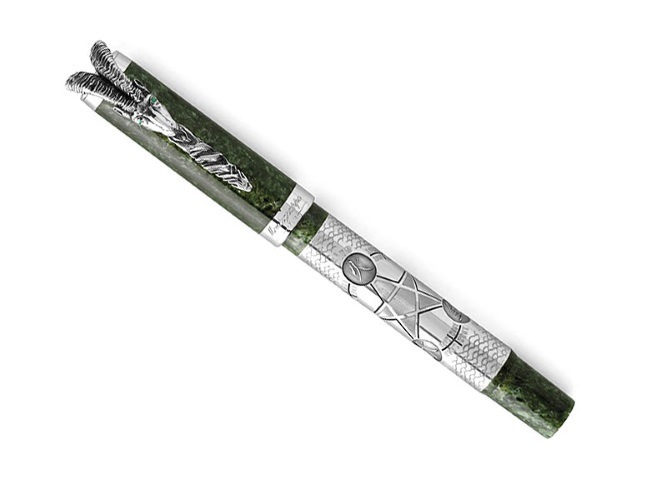 Montegrappa’s Year of the Goat 2015 will be produced as fountain pen and rollerball pen, with a green pearlised resin barrel and cap. The barrel’s centre section is made of engraved sterling silver or 18k yellow gold, engraved with the five elements: Fire, Earth, Metal, Water and Wood. In between the elements are the years during the past century that correspond to the Year of the Goat in that specific element. The cap is dominated by a pocket clip in the form of a proud goat’s head, with its eyes highlighted by emeralds. The Year of the Goat 2015 will be available in limited editions of 888 sterling silver fountain pens and 888 sterling silver rollerball pens, and 88 solid 18k gold fountain pens and 88 solid 18k gold roller balls.